We are lighting and show designers who have had over 20 years of experience each in theatre, event, sport and the music industry. We are looking for the challenge of making the rest of the world become part of the show, by making the whole environment look and feel exciting and incredible. Lighting design for us is a passion that starts when the sun shines through the window in the morning and ends with the correct colour temperature of the lamps just before sleep takes over. We live it every day, get frustrated when we see badly lit places and delighted when spaces are lit to reveal their full potential. Australian born Trent was claimed by the world of Lighting from the tender age of thirteen when he should have been chasing girls. Instead he was up a ladder lighting school productions, discos and the Queensland School of Ballet. 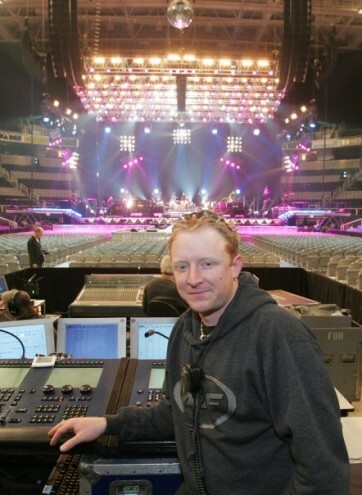 Trent is a firm believer in quality of product, as his work as a Lighting Director/operator for P!NK and Queen + Paul Rogers has demonstrated. He is passionate about his work and treats all installations, gigs or events the same; with a keen designer’s eye for detail and technical excellence, culminating in whatever epic transformatory experience the client desires. Whether a super-modern art gallery or crumbling ancient ruin, this Australian is keen to apply his lifetime’s knowledge of lighting using state of the art equipment with rock and roll wizardry, to create beauty, atmosphere and alchemy.